Select products from all Japan! Japanese sake and food pairing menu! Carefully chosen snacks to suit your sake! If you make dashi by yourself, it's much more delicious! How about you try shaving rock-hard bonito. The flavor is exceptional! 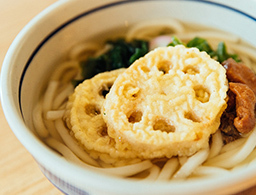 Iwakuni Lotus and Hakata Udon are outstandingly compatible! 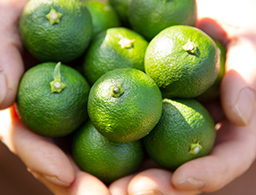 Japanese grown limes with a naturally high sweetness level are served juiced in and are actually good for you! 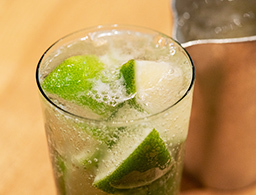 A domestic lime turns into a Japanese style marinade. Plenty of rare seaweed and vegetables are used by this greengrocer to make an authentic noriben! Yamagata tankakugyku rare short ribs! 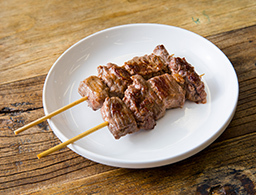 We recommend the rare tankakugyu beef skewers! 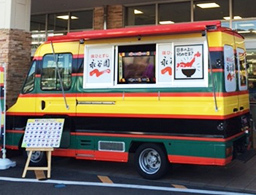 Taste Miyazaki’s local chicken grilled on-the-spot! 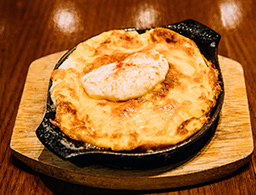 Try it with the special miso sauce for a wonderful local flavor! 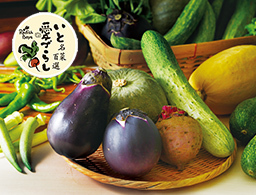 Miyazaki kiseki miraculous eggplant is fun to eat with miso! 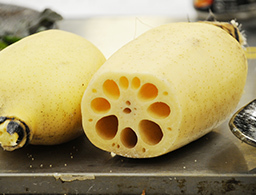 Taste the transformation of lotus root into a fantastic dish! Vegetable snacks using “Bon Curry”! We’ve found the perfect rice for Bon Curry! 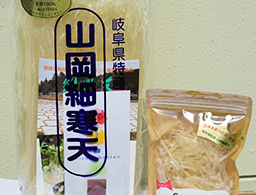 We have lots of Fukaya, Saitama bean sprouts with excellent grilled pork! 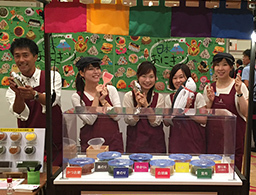 Experience the fusion of traditional Japanese sweets and the innovative technology! 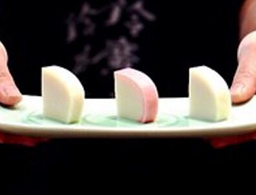 Learn about gohei mochi, make it & eat it too! What?! Cooking rice according to its characteristics! Tea served from tea pot is so different! Do you know how to make an unbelievably good lemon sour cocktail? DIY Tofu is the best! 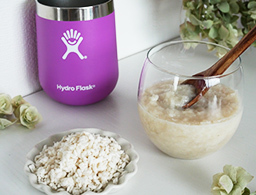 Delicious DIY sweet sake made in a thermos!? How about authentic Japanese sweets made from seasonal fruits? 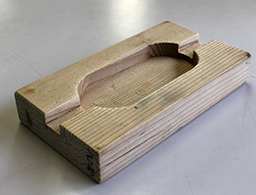 See the tool that is used to make the famous agar! 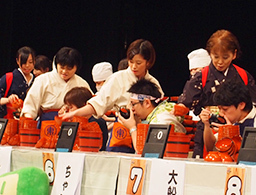 The Gohei mochi machine is coming! Try digging for taro root! "I didn't know the first rice crop could be so good!" The secret is.. The world's first, no tears onion! Super rare! "Yukari 3 sisters" and other limited items! How about a cup of traditional tea? Have you ever tried a purple sweet potato from Tanegashima? We've gathered all the charming items from Okinawa! Hashigo is bar hopping in Japanese! Let's try it! Have fun drinking with your tie around your head. Give it a try! Cosplay like a sake bar master! Try shaving rock hard, dried bonito. The flavor is exceptional! Have you ever touched an authentic rice barrel? We are making senbei right in front of your eyes! After an exciting karate trial, have some soy milk! Let the rice ball race begin! Want to ride “Bon curry No. 1”, a rice planting machine? Be wrapped in the gentle and fierce sound that comes to life. From the first note, the entire area will become a musical paradise. The powerful voice of Bird pulls you into the night atmosphere. 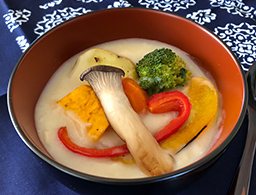 Directly from one of Fukushima’s own farmers, fresh vegetables are pickled in traditional Sangohachi filled with umami and gut healthy bacteria. 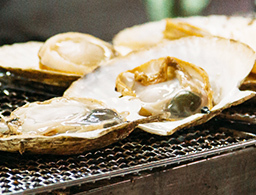 Taste the delicous flavor of the sea with Sanriku's freshly grilled scallops. 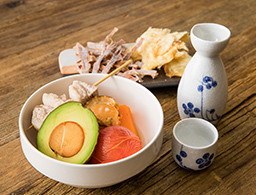 Try the fruits and vegetables with a natural sweeetness and fermented sake's umami. 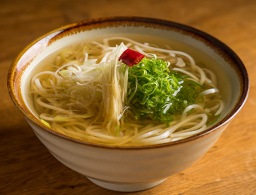 Enjoy the wonderful taste of agodashi soup and experience the flavor of Goto’s deeply rooted in udon culture. 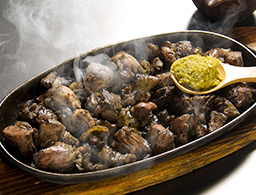 Local kara age, famous offal soup, wheat noodle and more delicious foods will be served! 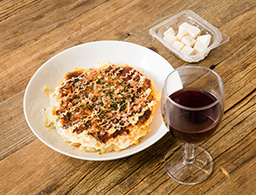 Did you know there are perfect alchols to match Japanese food stall offerings?Okonomiyaki for wine, gyoza for shochu, oden for sake, beer with yakisoba! Please enjoy the pairings! The perfect match is waiting for you! We've brought snacks from all over Japan that pair wonderfully with Japanese alcohol. Traditional food items can be found here! 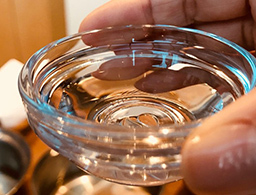 Join the workshop to learn about Japanese traditional food, kamaboko from Suzuhiro and the perfect pairing of sake from Miyasaka, a brewery with a 350 year history. 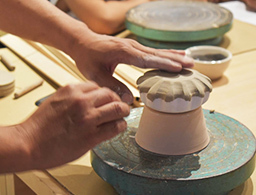 Enjoy a talk session with two masters at this workshop. 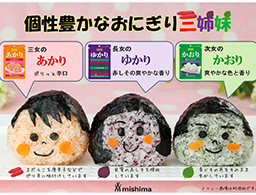 Let's make an onigiri with fillings from every prefecture! 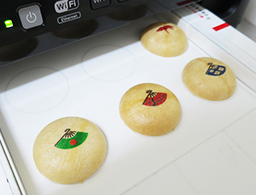 We’ve gathered fillings from every prefecture in Japan! 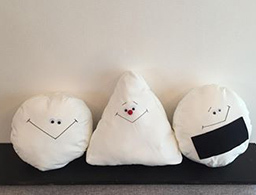 Have fun making your own rice ball at this workshop. 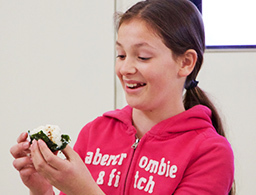 Do you know the difference between onigiri and omusubi? Learn about Japan and all about rice balls! Hear the secret story of Japanese rice balls. Since long ago sea bream has been a symbol for celebration that cannot be missed. It's been eaten for good luck and can now be easily made at home with Kit Oisix for those who are not accustomed to cooking. Experience how convenient and easy making this dish can be at the workshop. 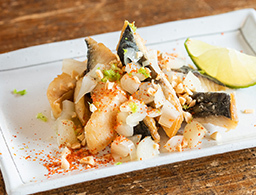 Freshly shaved bonito has an exceptional flavor! 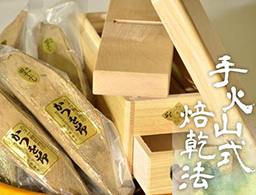 The traditional process tagobushi¸ has been praised for the well-preserved salt water katsuo fish. We’d love to share that culture with you. You can enjoy freshly shaved bonito with wasabi from Nishizu city! 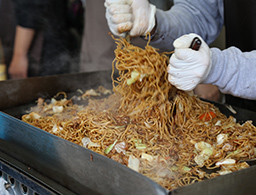 Have you seen wanko soba? Experience super speedy Japanese fast food. It’s unreliable! A farm in Tokyo? 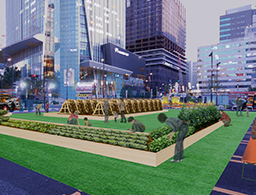 For 3-days only enjoy Tokyo Harvest’s pop-up farm at Toranomon. 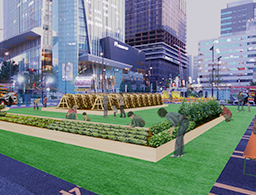 Experience harvesting fresh vegetables right in the city center! 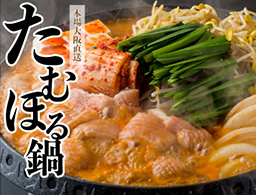 岩Iwakuni Lotus and Hakata Udon are outstandingly compatible! 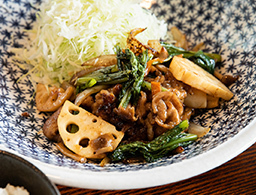 Japanese pork, lotus root and komatsuna are cooked in black vinegar and served teishoku. 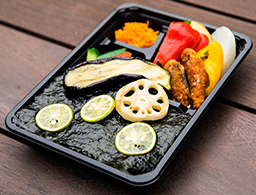 Vegetables from the greengrocer are used to make noriben! Hai- Sai & Passion! From Kitanaka Gushuku, Okinawa we bring you beer crafted with plenty of raw passion fruit that has a unique aroma and subtle acidity. 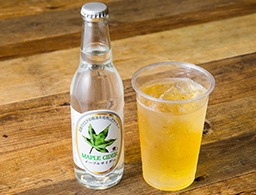 We recommend you try this beverage even if you don’t like beer, you may like it! 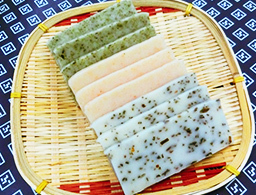 Do you know the seaweed called aasa? The essence of the sea is captured in the wonderful aroma and fried up in this green fritter! Yamagata tankakugyu rare beef short ribs skewers! In the summer they graze on the mountain, in winter they rest in the barn. This natural process of “technique”, “experience” “love” is Yamagata’s way of raising tankakugyu. 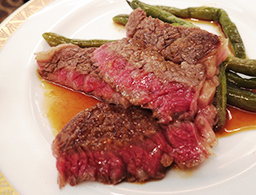 We have only a limited amount of this special rare beef and will be offering only 20 servings! Deliciously juicy and full of flavor, the rancher who produced these beef skewers will grill one up for you (Saturday only!). 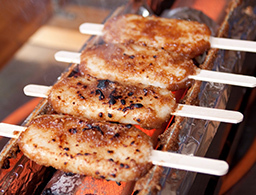 We’ve brought you the local favorite of Miyazaki prepared barbequed by local craftsmen. Enjoy it with a special rich flavored miso from Horikawaya Nomura that is protected by Japan’s oldest Temple. Miyazaki local grilled chicken and kiseki miraculous eggplant are the best! Miyazaki’s miraculous eggplant species has been revived from a few seeds. 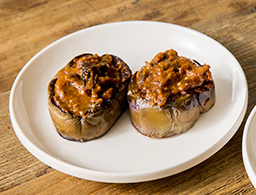 Please take this chance to try this traditional eggplant with rich and sweet flavored miso. Ibaraki produces the most lotus roots in all Japan! The texture of this lotus root is soft and fine, and like a piece of good sashimi, it’s best eaten raw! CRAZY KITCHEN has created a fantastic party atmosphere and excellent menu that draws out the charm of the lotus root. 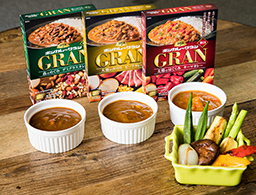 To celebrate the 50th anniversary of Bon Curry, we present a petite luxury of Bon Curry GRAN! 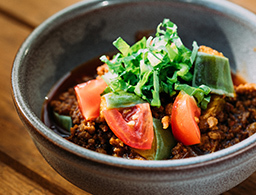 Try the three flavors: demi-glace, beef curry, keema curry along side perfectly grilled vegetables and a baguette! 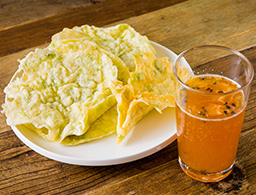 Accompany this curry with some alcohol for a perfect snack! 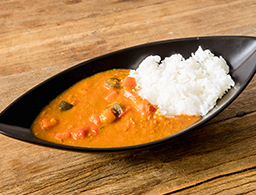 To celebrate the 50th anniversary of Bon Curry, we present a petite luxury of Bon Curry GRAN! Try the three flavors: demi-glace, beef curry, keema curry along side perfectly grilled vegetables and a perfectly paired rice! 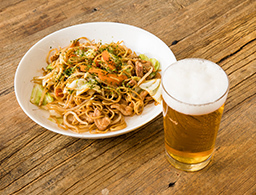 Accompany this curry with some alcohol for a perfect snack! These bean sprouts were cultivated without any growth hormones, using water and the natural nutrients of the bean. 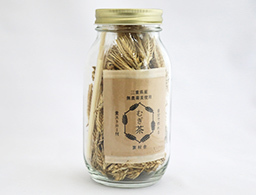 Please enjoy the shiny color, crispy texture and herb-like fragrance of these bean sprouts. 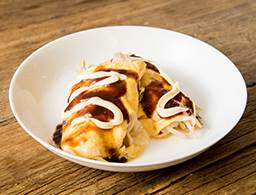 All the ingredients of this dish are local Fukuya grown products! Make your own monaka snack! 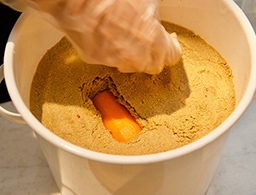 Using the latest food printing technology, you can make your own monaka to enjoy! 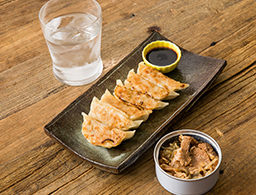 Try this traditional Edo period snack in a new way! Try making your own furikake, rice seasoning blend including limited products like the popular ""Yukari 3 sisters"" seasoning that is only sold in select stores. For a few years at the end of the Edo period, “Usukiyaki” tableware was sold, but then disappeared off the shelfs. 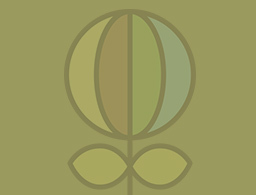 Recently this classic design has been reprinted in a contemporary style and is gaining popularity. Now is your chance to try making this limited Usuyaki city craft. Everybody's favorite bar snack, Kameda's kaki-no-tane! Everyone’s favorite Kameda’s kake-no-tame as a rice topping? 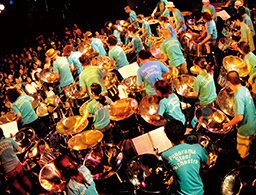 !We’ll introduce a great arrangement of the new “Furikakikkusu”. Give it a try! The treasure of Fukui, this rice is so good! Have you ever seen rice sold by weight? Using the traditional futoshi, we sell just the amount you want. Come and see the regional products unknown metropolitian Japan. 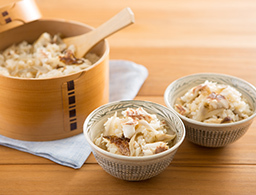 Tobo mochi is a cylinder rice cake that is unique to Hokuriku Fukui. Come to Fukui's specialty! Popularized on Japan’s NHK television, we have a traditional Japanese snack: Gohei mochi with sweet soy sauce from Ena city. 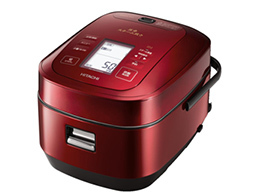 Hitachi's newest rice cooker "Fukkura Gozen"
Try rice made in Hitachi’s latest rice cooker, “Fukura Gozen. 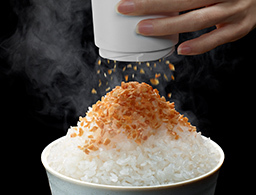 Hitachi’s pressure steam cooking method and high temperature iron pot draws out a powerful fire power and cooks delicious rice. 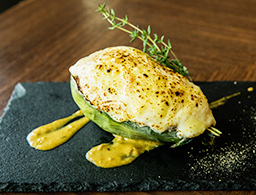 From Western point of Fukuoka where you can feel the grace of the sea, we bring you the best fisherman's recipes both nutritious and filled with umami. Who knew tea could be so fun! Do you usually drink tea served from a tea pot? 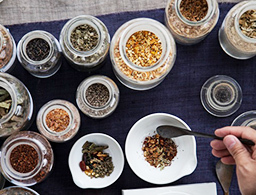 Learn how to make delicious tea. An old style drinking street has popped up on Toramon Ave. 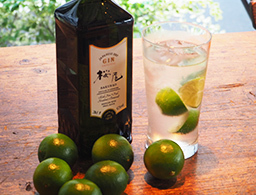 Enjoy the warm atmosphere of Japanese drinking culture. Learn the secret to make an incredible lemon sour cocktail straight from a lemon farmer! The green lemon in October is very fragrant. That aroma and the tartness of the lemon is key to making an amazing lemon sour. 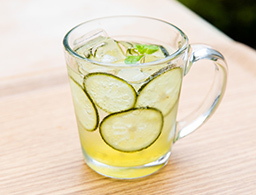 Come learn how to make this recipe step by step with a lemon farmer. Participation is only 3000 yen! Tofu is made by professionals with the shout of “yutaka tounyuu ipattsu yose”.Freshly made and still warm, tofu made by your own hands is fantastic! “I want to make Japanese pickled but I don’t know how to start.”“It‘s difficult to find the ingredients” . Don’t worry! 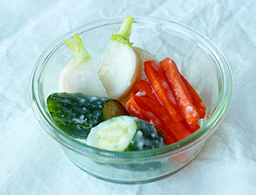 We have prepared the pickling tools and ingredients so you can make nukadoko in a fun and easy way! 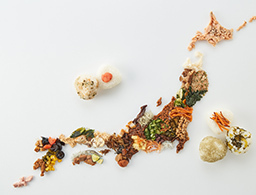 We’ve brought the pride of Japan, rice from all over the country so you can enjoy piping hot rice, freshly formed into onigiri by your own hands. Relax, have fun and dig in! 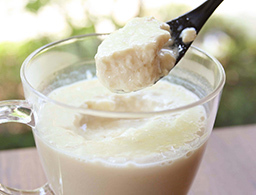 Amazake, Japanese sweet sake is good for your skin, health and it’s tasty! Did you know you can easily make it in a thermos? 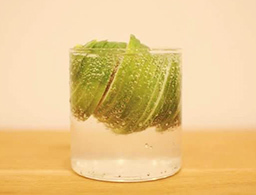 Learn how to make this traditional nutritious drink at the workshop. 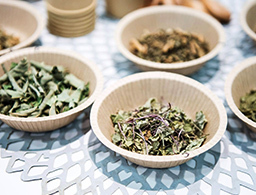 Brew your own pesticide-free barley tea! Roast, boil and brew barley wheat tea then finally drink it with a wheat straw! 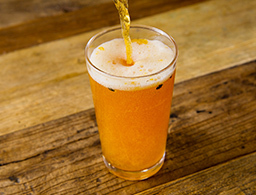 Enjoy authentic barley wheat tea. We also have tea sweets and waffles to enjoy! 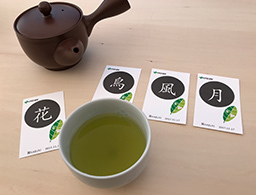 Traditional Japanese herbs are blended into a medicinal tea which you can sample and find a tea that suits your body perfectly. Let’s enjoy tea time! Venture Cafe Tokyo is a diverse community of innovators, investors, researchers and entrepreneurs. This time, in collaboration with Tokyo Harvest we welcome the agricultural producers to engage in a conversation about food. Fruits and traditional Japanese sweets are a great way to enjoy seasonal flavors. Sweet, sour, bitter, there are so many flavors to try! Learn how to prepare delicious seasonal fish and the secret to cleanly eating everything off the bone! 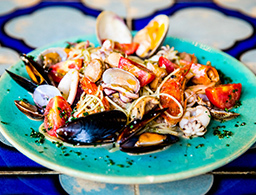 Join with your family to enjoy eating amazing fish! Introducing a new delicious food each day! 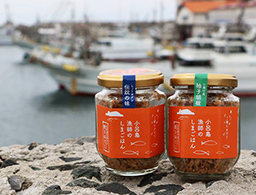 From the site, ""Furusato choice"", different local specialty products are introduced daily. From fruits and vegetables such as citrus fruits and tomatoes, special products such as honey, etc. even if you stop by everyday it's fun! Have you ever seen an agar making machine? You can see the speciality agar machine of Ena! Gohei mochi & gohei sauce are for sale. You can see and touch the mochi making machine! 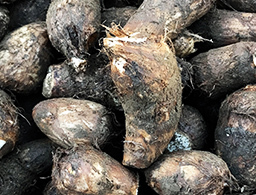 Iwaki climate and soil is ideal for growing mouth-watering, juicy taro. 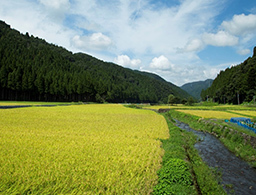 Have fun digging through the hot Iwaki soil and experience what it’s like to dig and harvest taro. "Yoneya gorobei goku" is only 1% of the total harvest of JA Tokamachi. 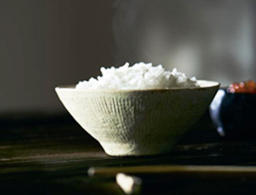 This rare rice is specially cultivated to meet quality standards without the use of fertilizer and pesticides. Sample Tokamachi, Niigata's "Uonuma Koshihikari" rice made in the newest & strongest, Hitachi's newest rice cooker "Fukkura Gozen" ! Tsushima is blessed with a wonderful forest of acorn trees that are used to grow shiitake. Please grab as many shiitake as you can and feel the beauty of Tsushima. The Sara Sara Farming Group from Kuriyama、 Hokkaido has carefully cultivated “smile ball” and “smooth red”. They are the world’s first non-spicy onions! The onions are sweet and crispy. Please try them raw! 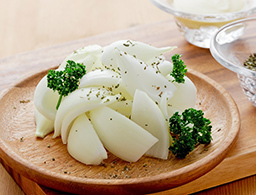 Since 1970, "Yukari" has been a hit product with its red shiso and dried plum flavor. 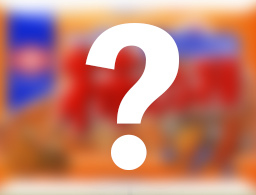 There are many new products and limited items to check out! An umbrella and a red seat. That's the traditional image of an old teahouse. Why not you have a cup of tea while enjoying the atmosphere? Tokushima Prefecture grows the most fragrant citrus in Japan. We've brought produce straight from the orchards of Kamiyama city. Please try the " B Tama sudachi" citrus! 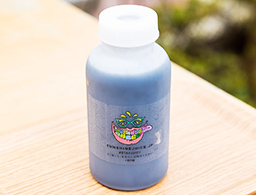 Jinoya is a delicious fermented beverage made from rice koji and purple sweet potato. 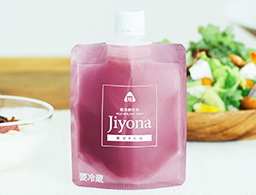 It combines nourishment "jiyo" and natural "na" and is an easy and healthy way to get many nutrients. If you have rice and water, you can easily make ochazuke, a super fast Japanese tea and rice dish. "Hai-sai" and Passion! 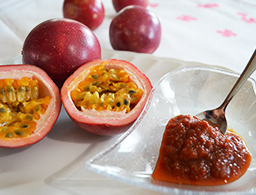 Next to the food stalls you'll find Kitanakagushuku Okinawan passion fruit and more! Even if you are alone, sitting at the counter you'll be able to make new friends. That's the beauty of yatai food stalls. You say you'll go after one drink, but one after another you keep having fun. It's hashigo! Please stop by the food stalls and try Japanese bar hopping. If your tie is still intact, you look a too little formal. Try the iconic Japanese image and wear your tie around your head! We'll lend you a tie so you can try. Since you are in Japan, why not try cosplaying? Dress like a sake bar master. Anyone can try it! Don't forget to tag us on Instagram! The essence of Japanese food culture is dried bonito. How about trying to shave this stone-hard, dried fish yourself? 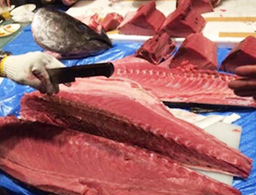 Learn from a professional how to shave katsuo and about the most delicious way to eat it. 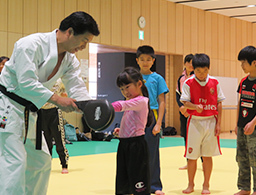 Children can try this experience too, so please join with your family. 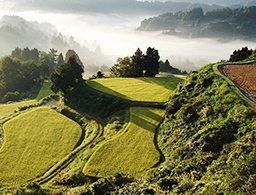 Experience authentic Japan! We have a real straw barrel filled with rice for you to touch. Can you guess how much it weights? When you think of senbei, it must be Kameda. Experience fresh senbei made right in front of your eyes! 100 of the Most Loved Veggies! From the local regions of Japan, we bring you traditional vegetables grown based on the local food culture and regional climate. You'll find many rare vegetables that you have never seen or tasted before. Please come try our vegetables! This year we have transformed the staircase to recreate the iconic imagery of Japan’s countryside with a beautiful rice field table top. Everyone, please grab a seat and enjoy good food and conversation around while enjoying the scenery. See the art installation of dyed vegetables flying above the field.Enjoy the gentle colors, sound of the wind and atmosphere. We have a field and also… shiitake mushrooms still growing on logs! 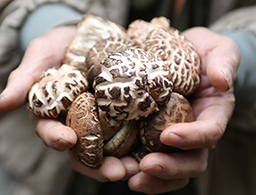 Even if you don’t like mushrooms, why not try harvesting your own fresh shiitake? It’s fun! 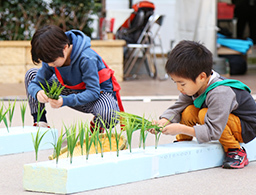 Get ready for an intense rice planting race! Hey everyone let‘s work up an appetite with some harvest games! Join the fun and experience farming in a sporty new way! Let's Challenge! Karate & Soy milk! Join to experience the wonder of karate. Have fun with your family and drink nutritious Kikoman soy milk after the event. Food and music. Everyone let's sing! If you sing about foods you dislike it's fun! And if you eat in a fun way, it's even better! Let's sing and dance together. Let’s move our bodies and work up an appetite! This year we have a new harvest game for you to try! It’s going to be so fun! "Bon Curry No. 1" is in Tokyo! 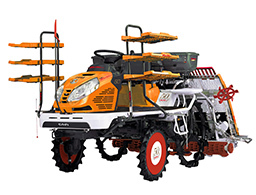 Celebrate the 50th anniversary of both Bon Curry and Kubota’s rice planting machine! We can test drive rice planting machine, ""Bon Curry"" born in celebration! Let's take a ride with your family! 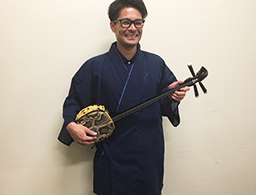 We've brought the feeling of Okinawa with a traditional sansen instrument. Enjoy the island vibes! Bird fascinates music fans with songs filled with a groovy singing voice and originality. 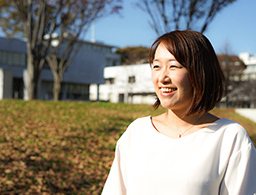 The latest work created with Tomita Lab will also be presented. 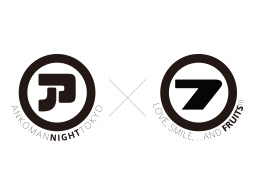 Please enjoy Tokyo-Harvest's unique live concert, while feeling the comfortable night-breeze. 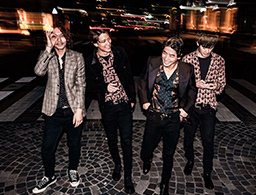 With a unique mix of English and Japanese, this rock band is displaying world class style and catchy tunes that you won’t be able to get out of your head. Get ready to rock with I Don’t like Mondays and be sure to see the simultaneous launch of their fashion brand “RESTIR” too! 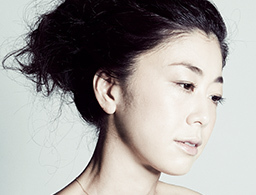 Born in Fukuoka, she joined a theater group and preformed in major productions like Lion King and Cats. Since 2015, she has been working as an independant actress. * Some of the contents may be changed without notice. ""Tokyo Harvest 2018"" is undertaken as a ""pilot project related to the Olympic and Paralympic Basic Policy Promotion Survey"" commissioned by the Cabinet Secretariat Tokyo Olympics and Paralympic Games Promotion Office Secretariat. 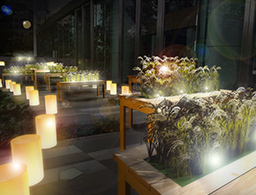 "Tokyo Harvest2018" has been adopted as "Project to Communicate Tokyo’s Charm"*. 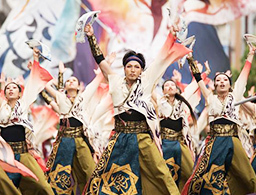 *"Tokyo Tokyo Old Meets New" is the brand icon of "Project to Communicate Tokyo’s Charm" where municipal and private enterprises cooperate to share the wonder of Tokyo.